I do not remember where I read this link, but “Personal Renewal” is a really nice speech delivered by John Gardner to McKinsey & Company, Phoenix, AZ in November 10, 1990. I decided to run a small experiment and advertise this blog using at most $5 in one day with 2 different advertising platforms, Google Adwords and Facebook. I used the subtitle words of this blog as keywords, I selected the USA as target, 1 day period, $5 as the budget for the day, 0.43 as the maximum bid. In Facebook I could choose the age and other demographics, basically the same data people add to their Facebook account. In Google this is possible if you choose to show your ad also in the adsense network, but I decided to use only the search. In Google, it is possible to be more precise with the geographical location and I specified, for example, California as the target. Both platforms allow us to focus on certain segments using the geographical location and some demographics data. The number of impressions in the two cases is substantially different, 15 impressions in Adwords against the 22,475 impressions in the case of Facebook. This can be probably be exaplained by considering that in Google the ad was shown only when it was related to the search terms, in a certain sense it is more targed and I did not raise my bid. However, one person clicked on the ad in Facebook and reached this site. Total cost of the campaign, $0.36 and 1 CTR. 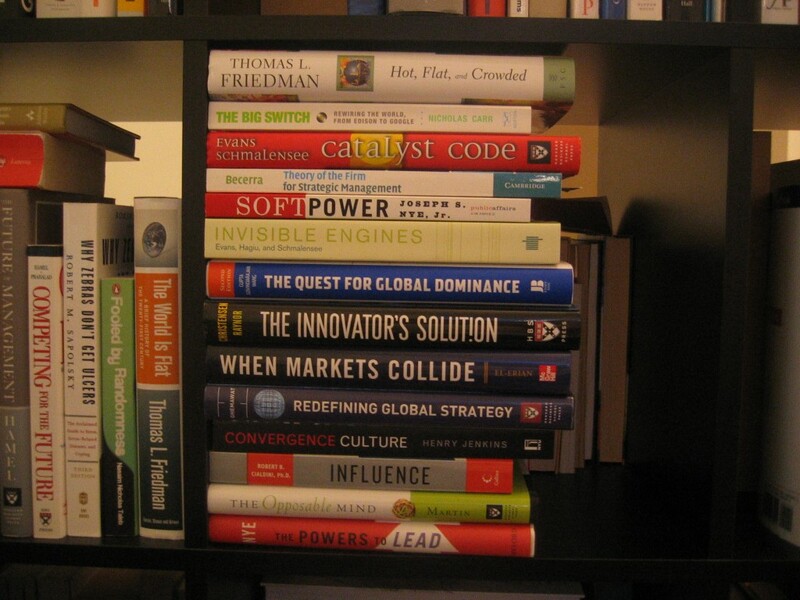 Following the example of Matt Cutts on his blog when he asked suggestions on interesting books to read. In the image below (in the horizontal position), some of the books in my reading list, suggestions on additional interesting books are welcome. My paper on how to use social network analysis to improve software evolution has been accepted by the Journal of Software Maintenance and Evolution. I have really worked hard for this paper but I am now satisfied with the outcome. I have to thank my colleagues at the Nokia Research Center and the reviewers that have pointed out the parts that needed more work. I liked writing this paper, I hope you will enjoy the reading. You can download the paper here: Comprehend and analyze knowledge networks to improve software evolution. When a set of people are connected by a set of social-meaningful relationships we talk of a social network. A social network represents a social structure and the underlying structural patterns can be used to analyze and comprehend how people relate to each other and their emergent behavior as a group. Developing software is fundamentally a human activity. Developers cooperate and exchange knowledge and information, creating in fact, a particular type of social network that we call knowledge network. In this paper we investigate knowledge networks in software development teams by applying social network analysis and we use the Apache web server as case study. By analyzing the structural communication and coordination patterns in Apache we have been able to identify the Apache knowledge network, highlight potential communication bottlenecks and find brokers and important coordination points in the software development team. Furthermore, our work enables a software architect to analyze and maintain the organization and the software architecture aligned during software evolution. An important lesson we have is that the analysis of knowledge networks constitutes an additional tool to be added to the traditional software architecture assessment methods. Septer 13, 1970 Milton Friedman writes in The New York Times Magazine the influential article The Social Responsibility of Business is to Increase its Profits. In this article, Friedman explains the traditional orthodox approach in economics to the firm’s social responsability. This view has been debated ever since. We cannot ignore that business has a wide influence and impact on our society and environment, the pure profits view somehow limits our analysis. Recents are the cases of Nike’s exploitation of workers in economically struggling countries, BP ecological stance and the backslash caused by oil spillages and Wal-Mart problems with its reputation. It is clear that a corporation must care about the society and the environment in which it operates. Of course, this does not contraddict Friedman’ s great article. The corporation has to protect its reputation and make sure to take all the measures to increase its profits. This includes being socially responsible and improve the environment if the management believes it will increase the company profits. People in the software and technology business are familiar with the concept of platform and software platform. However, a platform does not necessary need to be a software or hardware plaform think of the credit card industry. David Evans and Richard Schmalensee have written the Catalyst Code: The Strategies Behind the World’s Most Dynamic Companies to explain what drives the success of a catalyst and how different strategies may lead to a success or a failure. Essentially, a catalyst helps different parties (that need each other) get together, it facilitates the search and reduces the transaction costs. Think of, for example, of Google advertising model which brings together advertisers and users through the search engine. Users use the search engine for free, but the advertisers pay to display ads to the right consumers. The same authors of the Catalyst Code together with Andrei Hagiu have written Invisible Engines: How Software Platforms Drive Innovation and Transform Industries . If you are interested in strategic management, check the latest book of Manuel Becerra Theory of the Firm for Strategic Management: Economic Value Analysis . I have had Manuel Becerra as professor of Strategic Management at IE Business school and he is a great professor. Strategic decisions deal with the long-term direction of the firm and its main activities, usually the responsibility of the top managers in an organization. Because the firm is the critical unit of analysis in strategy, we need to define what firms are, how they create value, and what their organizational boundaries are in order to understand their overall performance. However, this must be done in a manner that is most useful for strategic analysis and decision making. In other words, we need a theory of the firm for business strategy. Theory of the Firm for Strategic Management integrates and expands key existing theories, like transaction costs economics and the resource-based view, to develop a value-based theory of the firm. This provides a framework to show how firms can create value for customers and, at the same time, capture economic profits for their owners through business, corporate, international, and social strategies. Shi Zhengrong in 2006 was ranked as the seventh-richest man in China by Forbes magazine. He is not in the real estate, banking or manifacturing businesses, he is China´s leading maker of silicon photovoltaic solar cells, which convert sunlight into electricy. A green China exists. Fortune magazine has an article about Shi, China´s new king of solar.